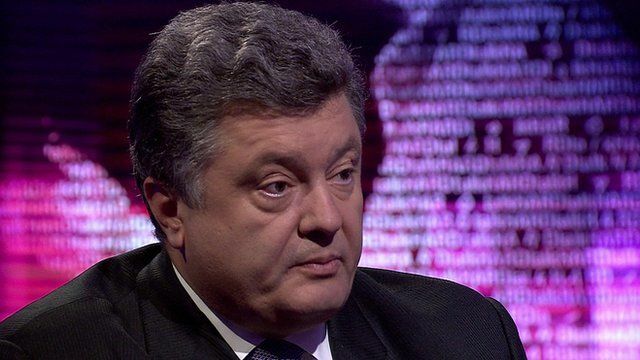 Ukraine 'united' on EU integration Jump to media player Ukrainian businessman and politician Petro Poroshenko tells HARDtalk Ukrainians are "united" in their support of European integration. Will Ukraine turn to EU or Russia? Jump to media player The decision by Ukrainian President Viktor Yanukovych to halt a significant trade deal with the EU has sparked mass protests in the capital Kiev, and the prospect of improved relations with Russia. 'Stop calling Putin a democrat' Jump to media player Former world chess champion and Russian opposition activist, Garry Kasparov, explains his decision to leave his home country. Wax on the 'addiction' of celebrity Jump to media player Writer, performer and mental health campaigner Ruby Wax has told HARDtalk about the "addictive" side of show business. Ukrainian President Viktor Yanukovych has defended his move to put a historic deal with the EU on hold, amid continuing mass protest rallies. The EU has accused Russia of exerting heavy economic pressure on Ukraine, but Russian President Vladimir Putin has denied putting any pressure on Kiev, accusing instead the EU of "blackmailing" Ukraine into signing the agreement. Ukrainian businessman and politician Petro Poroshenko told HARDtalk the Ukrainian people were "united" in support of European integration. "They hate the idea of people stealing their European dreams," he added. You can watch the full interview on BBC World News on Tuesday 26 November at 16:30 and 21:30 GMT and on the BBC News Channel at 00:30 on Wednesday 27 November. Go to next video: Will Ukraine turn to EU or Russia?